With the impending release of Star Wars: The Force Awakens, the franchise's fandom has never been greater. One of the several prominent Star Wars fan groups, the 501st Legion, put their powers to good use recently, by helping an eight-year-old fan named Layla Murphy overcome some harsh bullying at her school. After 501st Legion member Jason Tuttle met Layla at a fan convention, he lead the charge to give Layla their support. Here's a message from the 501st Legion's Facebook page, which reveals how they helped Layla overcome her bullying, with some assistance from 'Weird Al' Yankovic. "Layla is yet another young girl who was teased at school for liking Star Wars amongst other "boy" things. As a result of the bullying, Layla began to lose herself. She stopped wanting to wear her R2-D2 jacket and Guardians of the Galaxy shirt out of fear of being ridiculed. 501st Garrison Tyranus led the charge and rallied messages of support from ‪#501st‬ members all over the world to encourage Layla to be herself. Taking it one step further, Layla became the next recipient of the custom Stormtrooper armor originally built for another girl (Katie Goldman) who was in a similar situation. After suiting up, Layla was whisked away to meet "Weird Al" Yankovic at a local concert where 501st members were participating on stage. This excited young ‪#‎StarWars‬ fan now proudly carries the trading cards of her 501st supporters in a Chewbacca backpack and can't wait for the next opportunity to troop in armor. Her favorite part of wearing the costume? She loves when people say, "What a cute little boy!" only to discover that there's a girl under that helmet! ‪#‎BadGuysDoingGood‬ ‪#‎HeartOfTheForce‬ ‪#‎StopBullying‬"
Layla Murphy became an immediate Star Wars fan after discovering her father's toys around their Roanoke, Virginia home. After she moved to a new school, Layla was told that she shouldn't like Star Wars, because it's only for boys, with some even asking if she was turning into a boy. Here's what Layla's mother, Nicolette Molina, told CNN about the bullying. "At this new school Layla started coming home more quiet and less of herself, and started asking not to wear her shirts or R2-D2 jacket." After Molina told Tuttle about her daughter's bullying problem, he began sending stickers, patches and trading cards to Layla, and encouraged her fandom. Layla now feels "loved and accepted" while wearing her Stormtrooper outfit, and she gets a big kick out of people who think she's a boy under her costume. Layla's story comes just a few years after another young girl, Katie Goldman, was in a similar situation. Her fight against bullying lead to the creation of Wear Star Wars, Share Star Wars Day, which is held annually in December. 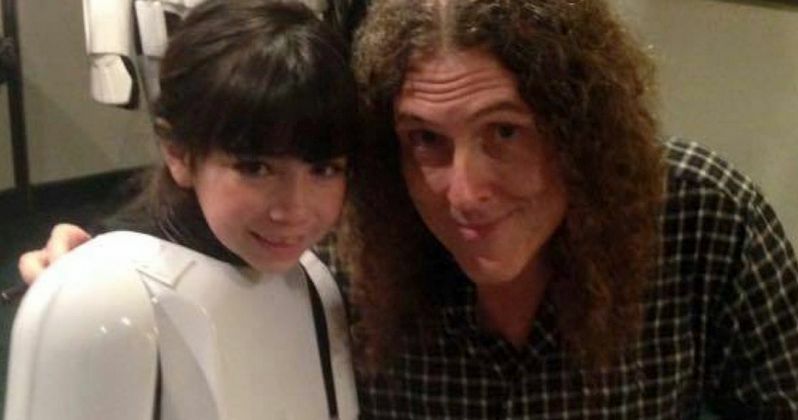 Check out the photo below with Layla Murphy in her Stormtrooper outfit and 'Weird Al' Yankovic below. You can also visit the 501st Legion's official Facebook and Twitter pages to find out more about the organization. What do you think about this Star Wars group's crusade to stop bullying?